yay! my swap package arrived so i can post this stuff at last. it’s such a long time ago i don’t remember much about this one so i’ll cut and paste my spinningfiber post at the time. there’s just a little over 200 yds, 5 oz, average 12wpi but there’s a bit of thick/thin variation. 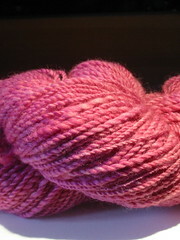 it’s 100% merino, so would felt, but it’s fairly tightly spun so shouldn’t pill as soon as you look at it. this started out as a commercially space-dyed pencil roving. it took a bit of getting used to as i had to spin S and ply Z because it already had a little Z twist to hold it together - and it was educational for me to see how little twist that thick a strand needs. it did feel like totally cheating though - my spinning-teacher-to-be thinks even using commercial top is cheating, so she’d have a fit at this :) i found myself deliberately putting in thick and thin spots to give it some kind of character.